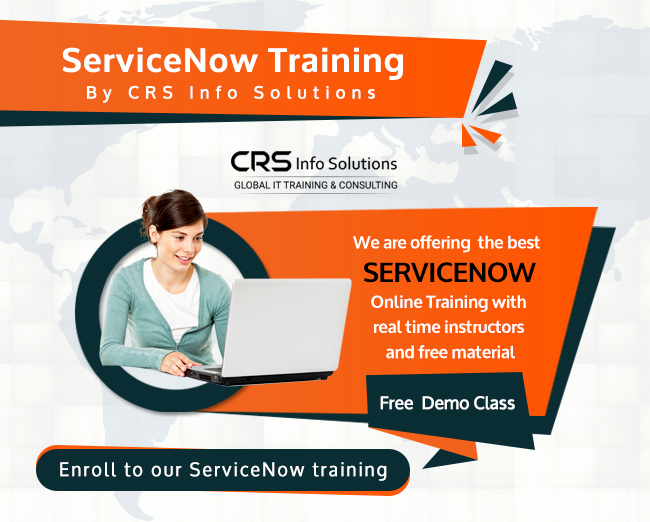 CRS Info Solutions offering professional ServiceNow Training program by real-time working consultants. CRS Info Solutions offering professional ServiceNow Training program by real-time working consultants covering topics such as Content and Configuration Management, User Licenses, Provides cloud computing and Exporting the Data from ServiceNow, Offering forms-based workflow application development. Fill our contact form to get more information regarding our ServiceNow training details and course starting details. Learner should have basic knowledge on database tables and columns and learners should be able to design, test and troubleshoot java script.